Sunset! It’s one of the most primal of our daily experiences and yet so often missed, or taken for granted. In the hurly-burly of our modern time-stressed lives, how often do we take the time to calmly sit, stare and fully immerse ourselves in this most beautiful part of simply being alive? When I moved to Phuket and made it my home some 12 years ago, I was immediately struck by the immense drama and power of the sunsets on the island. They were simply all-engrossing and impossible to ignore for their glorious magnitude and intensity. I had been living, like the majority of us these days, in a frenetic big city while pursuing a corporate career, and I had become detached from sunsets, as I had from so much of the glory of nature. Then one evening a Phuket local resident invited me along for “sun-downers” at The Boathouse situated right on the golden sands of Kata Beach. Of course, I had heard about The Boathouse’s fabulously romantic history and heritage. How Mom Tri Devakul, Thailand’s foremost architect and designer, had originally opened it in 1987 as a beach-side restaurant for his circle of famous friends. The cuisine and views were stunning and Mom Tri brought in the best chefs and international expertise from the chateaux of France to embellish the faire and build a spectacular wine cellar. Later on, Mom Tri added some lovely suites alongside the restaurant where replete dinner guests could collapse in grateful languor, and so one of the world’s most famous boutique resorts was born. Over the next three decades The Boathouse became a magnet for a glittering cast of Thai and western royalty as well as the simply rich, famous and discerning. Well known ‘celebs’ the world’s royalty and international names such as Peter Ustinov and Rudolph Nureyev, wined and dined at the beautiful beachside terrace and the very same elegant dining room in which you can sit today and witness the most fabulous sunset in the Andaman region. When I was first invited for a sunset drink at The Boathouse I knew much of the history, but I was completely unprepared for the overwhelmingly romantic sensory impact of the experience. I met my host at 1800 as the sky above Kata Bay, with its dramatic headlands and dreaming little Poo Island on the horizon, was painted like a pyrotechnic canvas of purples, pinks, gold and fading blues. Jackson Pollock meets Claude Monet on an acid trip perhaps? Or Charlie Parker playing hot jazz in a swirling cauldron of rainbows. So wonderful was that first Boathouse sunset that my host and I couldn’t resist segueing into a sensational supper in the resort’s restaurant, sampling a symphony of western and Thai dishes and availing ourselves of an unforgettable liquid treasure from the Boathouse’s 600-plus label wine cellar. Since that seductive day, I have become a Boathouse sunset addict and have repeated the experience maybe a hundred times, but it has never lost its ability to engender pure romantic wonderment in me that anything on this good earth can be quite so quintessentially lovely. The Boathouse today offers an exceptional blend of its original elegance and traditions with a distinctly contemporary style. Renowned international Executive Chef Jonathan Bruell and his team work their culinary magic every night, while the wines and service are second to none. 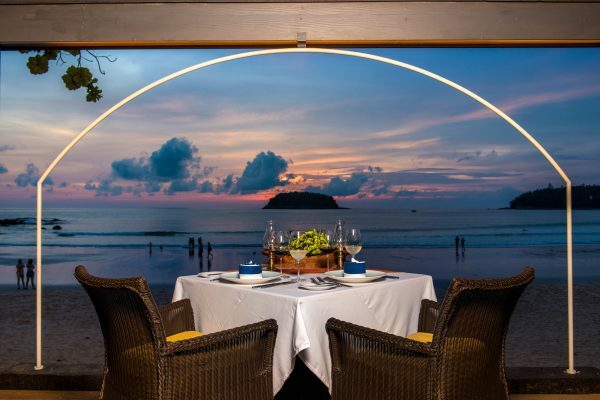 It’s not surprising that The Boathouse restaurant is much-awarded for the excellence of its cuisine and extensive wine cellar by such experts as Wine Spectator who year-after-year rate it as one of the absolute dining treasures in all Thailand. But the pure sensory magic of sunset in this very special place, is something to which even my purple prose cannot do justice! It is so overwhelming that the only way to appreciate it is to experience it in all its sensory splendor for yourself, and I urge you to do just that as soon as you are able.